Failure to identify a patient's specific type of dementia can result not only in inappropriate treatment but also in needless excessive health care costs. With dementia affecting nearly 10% of individuals aged 65 and older, according to the Alzheimer's Association, the need for an accurate diagnosis has become more compelling than ever. 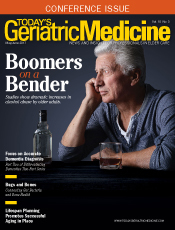 As discussed in Part One of this article published in the March/April issue, dementia is an umbrella term for a number of neurocognitive disorders, encompassing not only Alzheimer's disease (AD), which was addressed in the previous issue, but also vascular dementia, Lewy body dementia, Parkinson's dementia, and frontotemporal dementia (FTD), with a similarity of symptoms existing among the disorders. Vascular dementia can be differentiated from AD by the early onset of gait disturbance, falls, and urinary changes. Idiopathic normal pressure hydrocephalus may mimic vascular dementia with its symptom triad of ataxia, urinary incontinence, and dementia. As with AD, patients and families need to prepare for the course of this dementia, considering all safety, legal, financial, and power of attorney issues. Families experiencing DLB should be encouraged to explore the Lewy Body Dementia Association's website, www.lbda.org. Parkinson's disease is a progressive neurodegenerative disease with motor function deficiencies. Compounding progressive declines in gait, motor function, activities of daily living, and neuropsychiatric symptoms often occur, with elders at greatest risk. Parkinson's disease psychotic symptoms of presence and visual illusions affect up to 72% of individuals with Parkinson's disease. The prevalence of visual hallucinations reaches approximately 50% over the lifetime of a Parkinson's patient.15 PD-D is estimated to occur in between 50% and 80% of people with Parkinson's disease. The average interval between onset of Parkinson's disease and PD-D is approximately 10 years.16 Parkinson's disease psychosis (PDP) precedes or occurs with PD-D.
Parkinson's disease caregiver support is available at www.parkinson.org/find-help. Information on PDP for patients/families is at www.nuplazid.com. FTD, like early-onset AD, strikes at a younger age. Several FTD variations exist, including behavioral-variant FTD, nonfluent variant primary progressive aphasia, and semantic-variant primary progressive aphasia. There are no FDA-approved medications for FTD. Most of the studies on the management of FTD have been small and case-based or have had mixed FTD types in samples. The strongest trend cited is that antidepressants (selective serotonin reuptake inhibitors) may help manage behavioral symptoms in FTD patients and are well tolerated.38 The Association for Frontotemporal Degeneration (www.theaftd.org) should be offered as a resource to patients and families; spouses and children are younger than those involved with other dementia types apart from early-onset AD. General dementia advice on safety, driving, planning legal and financial strategies, power of attorney issues, and caregiver support is essential for families facing this challenging dementia. Part One of the Differentiating Dementias article series introduced how distinguishing Alzheimer's from other dementias through a full dementia workup is essential to optimal quality of life for a patient, family, and caregivers.1 The fact that the diagnostic category of "dementia NOS" (dementia not otherwise specified) was used in 92.9% of 21.6 million recent fee-for-service Medicare recipients strongly suggests that only 7% of elders received a full cognitive/functional/behavioral history, physical examination, and diagnostic studies to diagnose their specific types of dementia.39 This is not acceptable; there are unique safety risks that vary by dementia type (eg, fall risk in DLB and an even higher stroke risk when using an antipsychotic in vascular dementia). Ignoring these differences may result in hospitalizations for stroke, hip fracture, or mortality. It is our ethical and fiscal responsibility as primary care, specialty, and long term care clinicians to give dementia the same diagnostic attention as any other chronic illness regardless of the age, living situation, or social support of a demented person. Hospitalizations doubled for Medicare beneficiaries aged 65 and older with AD and other dementias (538 per 1,000) compared with 266 per 1,000 for Medicare beneficiaries aged 65 and older without dementia.6,42 Our health care system cannot afford to add extra costs by incorrectly diagnosing a type of dementia or, even worse, failing to diagnose dementia at all. — Susan Scanland, MSN, CRNP, GNP-BC, CDP, CSP, a certified speaking professional and practicing geriatric nurse practitioner, specializes in dementia behaviors and optimal pharmacotherapy. Through her firm, Dementia Connection, she's presented extensively on dementia in the United States, Canada, and Europe. She has served as an advisor or speaker for Alzheimer's pharmaceutical corporations and is a nursing faculty specialist at the University of Scranton in Pennsylvania. — Tyler Bielinski is a junior premed neuroscience major with a minor in biochemistry at the University of Scranton. He is a telehealth technician and student supervisor for the Telehealth Intervention Program for Seniors, which provides daily vital sign monitoring through the use of wireless technology to approximately 200 older adults throughout northeastern Pennsylvania. Beyond geriatrics, his research interests include the correlation of facial structure size with cognitive abilities, political orientation, and personality traits, and the use of cockroaches as invertebrate models for pharmacological manipulations of learning and memory. 1. Scanland S, Bielinski T. Differentiating dementias: Alzheimer's disease and its management. Todays Geriatr Med. 2017;10(2):20-23. 2. O'Brien JT, Thomas A. Vascular dementia. Lancet. 2015;386(10004):1698-1706. 3. Igoumenou A. Ebmeier KP. Diagnosing and managing vascular dementia. Practitioner. 2012;256(1747):13-16. 4. Anor CJ, O'Connor S, Saund A, et al. Neuropsychiatric symptoms in Alzheimer's disease, vascular dementia, and mixed dementia. Neurodegener Dis. 2017;17(4-5):127-134. 5. Kavirajan H, Schneider LS. Efficacy and adverse effects of cholinesterase inhibitors and memantine in vascular dementia: a meta-analysis of randomised controlled trials. Lancet Neurol. 2007;6(9):782-792. 6. Alzheimer's Association. 2017 Alzheimer's disease facts and figures. http://www.alz.org/documents_custom/2017-facts-and-figures.pdf. Published 2017. Accessed March 22, 2017. 7. McKeith IG, Dickson DW, Lowe J, et al. Diagnosis and management of dementia with Lewy bodies: third report of the DLB consortium. Neurology. 2005;65(12):1863-1872. 8. Emre M, Aarsland D, Brown R, et al. Clinical diagnostic criteria for dementia associated with Parkinson's disease. Mov Disord. 2007;22(12):1689-1707. 9. Scharre DW, Chang SI, Nagaraja HN, et al. Paired studies comparing clinical profiles of Lewy body dementia with Alzheimer's and Parkinson's diseases. J Alzheimers Dis. 2016;54(3):995-1004. 10. Ikeda M, Mori E, Kosaka K, et al. Long-term safety and efficacy of donepezil in patients with dementia with Lewy bodies: results from a 52-week, open-label, multicenter extension study. Dement Geriatr Cogn Disord. 2013;36(3-4):229-241. 11. Ukai K, Fujishiro H, Iritani S, Ozaki N. Long-term efficacy of donepezil for relapse of visual hallucinations in patients with dementia with Lewy bodies. Psychogeriatrics. 2015;15(2):133-137. 12. Manabe Y, Ino T, Yamanaka K, Kosaka K. Increased dosage of donepezil for the management of behavioural and psychological symptoms of dementia in dementia with Lewy bodies. Psychogeriatrics. 2016;16(3):202-208. 13. Matsunaga S, Kishi T, Iwata N. Memantine for Lewy body disorders: systematic review and meta-analysis. Am J Geriatr Psychiatry. 2015;23(4):373-383. 14. Baskys A. Lewy body dementia: the litmus test for neuroleptic sensitivity and extrapyramidal symptoms. J Clin Psychiatry. 2004;65(11):16-22. 15. Fénelon G, Alves G. Epidemiology of psychosis in Parkinson's disease. J Neurol Sci. 2010;289(1-2):12-17. 16. Parkinson's disease dementia. Alzheimer's Association website. http://www.alz.org/dementia/parkinsons-disease-symptoms.asp. Accessed March 22, 2017. 17. Emre M, Aarsland D, Brown R, et al. Clinical diagnostic criteria for dementia associated with Parkinson's disease. Mov Disord. 2007;22(12):1689-1707. 18. EXELON (rivastigmine tartrate) capsules, for oral use; EXELON (rivastigmine tartrate).oral solution. Novartis website. https://www.pharma.us.novartis.com/sites/www.pharma.us.novartis.com/files/exelon.pdf. Accessed March 22, 2017. 19. EXELON PATCH (rivastigmine transdermal system). Novartis website. https://www.pharma.us.novartis.com/sites/www.pharma.us.novartis.com/files/exelonpatch.pdf. Accessed March 22, 2017. 20. Schmitt FA, Farlow MR, Meng X, Tekin S, Olin JT. Efficacy of rivastigmine on executive function in patients with Parkinson's disease dementia. CNS Neurosci Ther. 2010;16(6):330-336. 21. Weintraub D, Somogyi M, Meng X. Rivastigmine in Alzheimer's disease and Parkinson's disease dementia: an ADAS-cog factor analysis. Am J Alzheimers Dis Other Demen. 2011;26(6):443-449. 22. Brennan L, Pantelyat A, Duda JE, et al. Memantine and cognition in Parkinson's disease dementia/dementia with Lewy bodies: a meta-analysis. Mov Disord Clin Pract. 2016;3(2):161-167. 23. Heckman GA, Crizzle AM, Chen J, et al. Clinical complexity and use of antipsychotics and restraints in long-term care residents with Parkinson's disease. J Parkinsons Dis. 2017;7(1):103-115. 24. Weintraub D, Chiang C, Kim HM, et al. Association of antipsychotic use with mortality risk in patients with Parkinson's disease. JAMA Neurol. 2016;73(5):535-541. 25. Samudra N, Patel N, Womack KB, Khemani P, Chitnis S. Psychosis in Parkinson's disease: a review of etiology, phenomenology, and management. Drugs Aging. 2016;33(12):855-863. 26. Weintraub D, Chiang C, Kim HM, et al. Antipsychotic use and physical morbidity in Parkinson's disease [published online February 2, 2017]. Am J Geriatr Psychiatry. doi: 10.1016/j.jagp.2017.01.076. 27. Desmarais P, Massoud F, Filion J, Nguyen QD, Bajsarowicz P. Quetiapine for psychosis in Parkinson disease and neurodegenerative parkinsonian disorders: a systematic review. J Geriatr Psychiatry Neurol. 2016;29(4):227-236. 28. Ravina B, Marder K, Fernandez HH, et al. Diagnostic criteria for psychosis in Parkinson's disease: report of an NINDS, NIMH work group. Mov Disord. 2007;22(8):1061-1068. 29. Ballanger B, Strafella AP, van Eimeren T, et al. Serotonin 2A receptors and visual hallucinations in Parkinson disease. Arch Neurol. 2010;67(4):416-421. 30. NUPLAZID (pimavanserin) tablets, for oral use. ACADIA Pharmaceuticals website. https://www.nuplazidhcp.com/pdf/NUPLAZID_Prescribing_Information.pdf. Updated April 2016. Accessed March 17, 2017. 31. Cummings J, Isaacson S, Mills R, at al. Pimavanserin for patients with Parkinson's disease psychosis: a randomized, placebo-controlled phase 3 trial. Lancet. 2014;383(9916):533-540. 32. Hunter NS, Anderson KC, Cox A. Pimavanserin. Drugs Today (Barc). 2015;51(11):645-652. 33. Bang J, Spina S, Miller B. Frontotemporal dementia. Lancet. 2015;386(10004):1672-1682. 34. Baugh CM, Stamm JM. Riley DO. Chronic traumatic encephalopathy: neurodegeneration following repetitive concussive and subconcussive brain trauma. Brain Imaging Behav. 2012;6(2):244-254. 35. Blanc F, Philippi N, Cretin B, et al. Lyme neuroborreliosis and dementia. J Alzheimers Dis. 2014;41(4):1087-1093. 36. Rosen HJ, Gorno-Tempini ML, Goldman WP, et al. Patterns of brain atrophy in frontotemporal dementia and semantic dementia. Neurology. 2002;58(2):198-208. 37. Le Ber I, Guedj E, Gabelle A, et al. Demographic, neurological and behavioural characteristics and brain perfusion SPECT in frontal variant of frontotemporal dementia. Brain. 2006;129(Pt 11):3051-3065. 38. Tsai RM, Boxer AL. Therapy and clinical trials in frontotemporal dementia: past, present, and future. J Neurochem. 2016;138(Suppl 1):211-221. 39. Goodman RA, Lochner KA, Thambisetty M, Wingo TS, Posner SF, Ling SM. Prevalence of dementia subtypes in United States Medicare fee-for-service beneficiaries, 2011-2013. Alzheimers Dement. 2017;13(1):28-37. 40. Hunter CA, Kirson NY, Desai U, Cummings AK, Faries DE, Birnbaum HG. Medical costs of Alzheimer's disease misdiagnosis among US Medicare beneficiaries. Alzheimers Dement. 2015;11(8):887-895. 41. Happich M, Kirson NY, Desai U, et al. Excess costs associated with possible misdiagnosis of Alzheimer's disease among patients with vascular dementia in a UK CPRD population. J Alzheimers Dis. 2016;53(1):171-183. 42. Avalere Health (under contract). Unpublished tabulations based on data from the National 5% Sample Medicare Fee-for-Service Beneficiaries for 2014. Published January 2016.